Do you desire intellectually stimulating, need-to-be-aware-of information as a stocking stuffer in the time crunch just before Christmas? Look no further. Douglas Valentine’s The CIA as Organized Crime: How Illegal Operations Corrupt America and the World fits the bill splendidly. Taking on the CIA as a subject is a monumental task, as its tentacles delve into myriad facets of empire and society. The CIA operates as a mafioso on a grand scale, an imperial scale. Valentine’s depth of knowledge on the subject is very apparent. The CIA is known as a surveillance and information gathering apparatus of the USA that engages in various international intrigues. That view of the CIA is superficial. The CIA as Organized Crime presents the CIA as much more and in decidedly more sinister shades. Among these shades, the CIA is a war criminal, torturer, assassin, arms smuggler, drug smuggling kingpin, media network, business empire, and more. The CIA is steeped in capitalism, girded in racism, masterminds and carries out “regime change,” has hands on the control of information and its communication, is creepily immersed in law enforcement and justice, and has a deeply corruptive influence on foreign governments, the DEA, NSA, military, and Justice Department, as well as on US members of Congress. Interspersed throughout the book, Valentine interjects essential encapsulations. In this way, his honest, tell-us-like-it-is tone conveys a moral and persuasive power. Valentine likens the CIA to the Mafia, seeing the CIA as an organized crime branch of government. Running mega-black ops is expensive, so the CIA requires money. That is where wars come in, and it is where drug smuggling comes in. The CIA as Organized Crime notes that the illicit drug trade is valued at $300 billion, and that is lucre the CIA seeks to control. Valentine calls the War on Terror the largest covert operation ever. Much of the structural and operational tactics originated in Viet Nam with the Phoenix Program — the title of one of Valentine’s books. US forces held a[n Iraqi] general’s three sons as hostages to persuade him to defect. But instead of releasing his sons as promised, they staged an elaborate mock execution of his youngest son, before torturing the general himself to death. 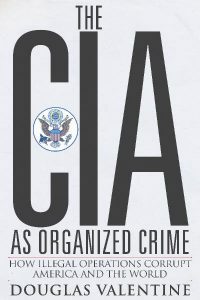 What comes through in The CIA as Organized Crime is that while the CIA, and its infamous Phoenix Program, attempt to throw a blanket of control over crucial facets of society, the blanket has holes: “… the resistance has infiltrated every entity the CIA has created in Afghanistan…” (p 106) The infiltration was made possible because of the egos of CIA officers. It is unsurprising that a psychopathic entity such as the CIA would be a bedfellow of another psychopathic entity — the corporation. … profit — fortunes would be made. Millions and billions of dollars would be piled up. By a few. Munitions makers. Bankers. Ship builders. Manufacturers. Meat packers. Speculators. They would fare well. What Valentine wrote about the CIA’s anti-leftism and pro-capitalism caused me to hearken back to Smedley Butler. There is a historical linkage between what Butler and Valentine write. Valentine calls for media consumers to be skeptical; and where he finds journalism to be suspect, he is unafraid to name names. He calls into question the progressivist bona fides and journalistic credibility of several prominent supposed progressives, including Chris Hedges, Glenn Greenwald, Jeremy Scahill, Amy Goodman, Daniel Ellsberg, and Seymour Hersch. It seems that a segment of independent journalism is not what it purports to be. Once hired recruits need not worry about what their job entails. CIA workers are untouchable since they are protected by plausible deniability and anonymity. Valentine writes that the inevitable outcome of Phoenix was not just the suppression of foreign peoples, but it morphed to be the ultimate weapon: social engineering. Valentine warns that the rest of us are all at risk. “The moral of the story is that you don’t have to commit a crime to go to prison. The law enforcement agencies can frame you and send you to prison for thinking bad thoughts.” (p 219) Whistleblowers know this all too well. Thus the question arises: what can we, the common people, do? Justice is corrupted, and the media is co-opted. How should a person overcome media disinformation and distortions? Launching such a revolution would trigger extreme resistance from entrenched interests, as the rich obviously view themselves as supreme. These elitists are not about to willingly ease their oppression of the masses. *****This review quotes heavily from the text of Valentine’s book. But then nobody puts it better in words than the author. But don’t let a fast approaching Xmas or a Xmas passing by deter you. Get The CIA as Organized Crime: How Illegal Operations Corrupt America and the World; you won’t be sorry. This article was posted on Friday, December 23rd, 2016 at 3:41pm and is filed under Book Review, Capitalism, CIA, Crimes against Humanity, Crimes against Peace, Espionage/"Intelligence", Imperialism, Militarism, War Crimes.